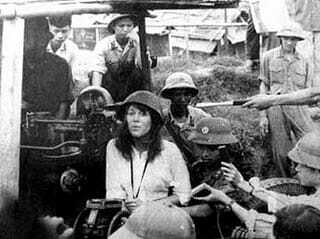 Hanoi Jane Fonda announced this week that she will build a shrine to herself. Maybe she’ll include a Viet Cong tank and a Communist flag? Jane Fonda made the announcement this week after “backsliding a bit of late” in terms of her mood. At 77, the actress is building a “shrine” to herself that she hopes will boost her recently faltering confidence. “I’ve found myself backsliding a bit of late in terms of where my thoughts have tended to reside (not always with the generosity of vision I wish for) and my confidence has been iffy for the past four months,” the stunning star wrote in a blog post Sunday, her 77th birthday. “So, while meditating today an idea came to me: I’m going to create a shrine to myself – or, at least, the self I wish to be, the self who began to manifest when I was a young girl before the s–t hit the fan,” she continued. The “shrine” will be a small place filled with items that remind Fonda of “the qualities that represent my best self.” So far, she plans to include a school report from the fourth grade.